Bandicam is a desktop screen recording tool and video/game recording software which offers different recording modes which are the game recording mode, device recording mode, video recording mode, and screen recording mode. Designed to capture and record gaming sessions, computer/video tutorials, online academic lessons, and walkthroughs; Bandicam is a recording software that is recommended for businesses and professionals aiming to produce short videos especially tutorial videos for their Youtube Channel or Social Media department or team. Using Nvidia’s H.264 codec in its recording capabilities, Bandicam has the ability to compress a file to a smaller size but can still maintain the quality of the original work or video. The game recording functionality of the recording software enables users to record game videos and gaming sessions which context or program is using the DirectX/OpenGL graphic technologies, recording them in full screen HD without including window borders smoothly and flawlessly. 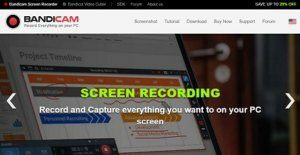 Designed with an easy to use interface, Bandicam ‘s screen capturing, video and sound recording, and device recording features aim to help freelance filmmakers and video editors as well as Youtubers capture their footages in simple ways but of high quality. Since Bandicam is primarily built to record high speed gaming, the game recording functionality that it is offering is outstanding. Equipped with basic and advanced settings and options, the game recording mode allows users to record the game footages of their installed games while they are running them. Before recording gaming sessions using the game recording mode, users are provided with options to configure some settings which would include General, FPS (frames per second), Video, Image, and Output. Within these categories of settings they would be able to define and set up the details of their game recording. In the Others tab located within the Advanced option of the General settings, users would be able to view the settings for video recording. An option is provided under the video recording settings where they could select their primary and secondary sound devices. Moreover, two-sound mixing could be enabled from here wherein both the primary and secondary sounds are recorded into one audio track. The Others tab also provides the auto-complete recording settings where users could set up the maximum file size and the recording time they want and define the after-recording settings. The add webcam overlay is another option which is available within the Advanced settings. Adding a webcam overlay allows users to enable the capturing of their webcam footage included on the recording screen. Adding a logo is also possible in Bandicam through the Logo tab. Bandicam typically picks images in PNG format in adding logos. Below the General settings is the Video settings where users could enable the showing of hotkeys while doing the game recording such as the record/stop hotkey, pause hotkey, and the option to add mouse click effects and show mouse cursor. In addition, the FPS settings enable users to set the limit of frames per second as well the rearranging of FPS overlays that would show as the recording progresses. The game recording feature of Bandicam is so dynamic, providing users the ability to produce a kind of work with high quality. Meanwhile, Bandicam’s screen recording mode is also dynamic. When doing a desktop screen recording, users would be able to customize their output by utilizing the interesting functionalities within it such as setting up arrows to point items, images, or objects on the screen, highlights to encircle them, and numbers to show steps,phases, or stages. Included in this mode is the pencil functionality that allows users to scribble and draw. These screen recording features of Bandicam is very effective and useful especially for producing video tutorials. Another interesting feature of Bandicam is its device recording functionality. Through this feature, users would be able to capture their real-time webcam screen and record it simultaneously with a gameplay. As mentioned earlier in the game recording mode, this is called the webcam overlay functionality. With hardware requirements and installation steps, Bandicam allows the recording from devices such as AppleTV, Xbox 360, iPhone, iPad, Android and Playstation 3/4, capturing the screen of these devices. This feature of Bandicam offers users the best recording experience for their gameplay and product development videos. If you are considering Bandicam it may also be beneficial to examine other subcategories of Best Digital Asset Management Software collected in our database of SaaS software reviews. It is essential to realize that hardly any software in the Digital Asset Management Software category will be an ideal solution that can fulfill all the requirements of different business types, sizes and industries. It may be a good idea to read a few Bandicam reviews first as specific services may excel only in a really small group of applications or be prepared with a very specific type of industry in mind. Others may function with a goal of being easy and intuitive and as a result lack complicated features welcomed by more experienced users. You can also find apps that focus on a wide group of users and provide a powerful feature toolbox, however that in most cases comes at a more expensive cost of such a service. Make sure you're aware of your requirements so that you buy a service that has specifically the functionalities you search for. How Much Does Bandicam Cost? We realize that when you make a decision to buy Digital Asset Management Software it’s important not only to see how experts evaluate it in their reviews, but also to find out if the real people and companies that buy it are actually satisfied with the product. That’s why we’ve created our behavior-based Customer Satisfaction Algorithm™ that gathers customer reviews, comments and Bandicam reviews across a wide range of social media sites. The data is then presented in an easy to digest form showing how many people had positive and negative experience with Bandicam. With that information at hand you should be equipped to make an informed buying decision that you won’t regret. What are Bandicam pricing details? What integrations are available for Bandicam?